October 26, 2018 Market Update. U.S. stocks have fallen sharply in October with major indices on track for their worst month of performance in more than eight years. After falling -3.9% last week, the S&P 500 index is down -8.8% for the month. As a result, the index has completely erased its year-to-date gain and now stands 9.2% below its record high posted in September, just shy of “correction territory” (defined as a 10% or greater decline in the price of an investment from its most recent peak). Other major U.S. stock indices such as the Dow Jones Industrial Average and NASDAQ have already breached this threshold. Concurrent with the sell-off in the U.S., international stocks have continued to face pressure. Developed market equities fell -3.9% last week and are down -11.2% for the year while emerging market equities dropped -3.3% and are down -18.9%. Concern about rising interest rates, peaking U.S. corporate earnings growth, and slowing global economic expansion appears to be driving the current pullback in stocks. Interest rates actually have fallen as some investors have rotated into fixed income and other traditional safe-haven assets. The yield on the 10-year U.S. Treasury Note reached 3.23% during the first week of October but has dropped back to 3.08%. This volatile period for financial markets has some investors wondering whether global stocks are entering a severe downturn. We would like to share our latest insights on the investment landscape with you and detail how we are positioning client portfolios. Our research suggests that the ongoing sell-off in U.S. stocks is a normal, healthy part of this market cycle rather than a signal that the bull run is ending. As we discussed in our Fourth Quarter Market Commentary, we remain constructive on the U.S. economy in spite of the extended length of this expansion. U.S. real GDP grew at an annualized rate of 3.5% in the third quarter, below 4.2% in the previous quarter but above levels closer to 2.0% that have prevailed for most of the recovery. The reading was fueled by robust consumer and government spending. Business investment grew at a modest pace. 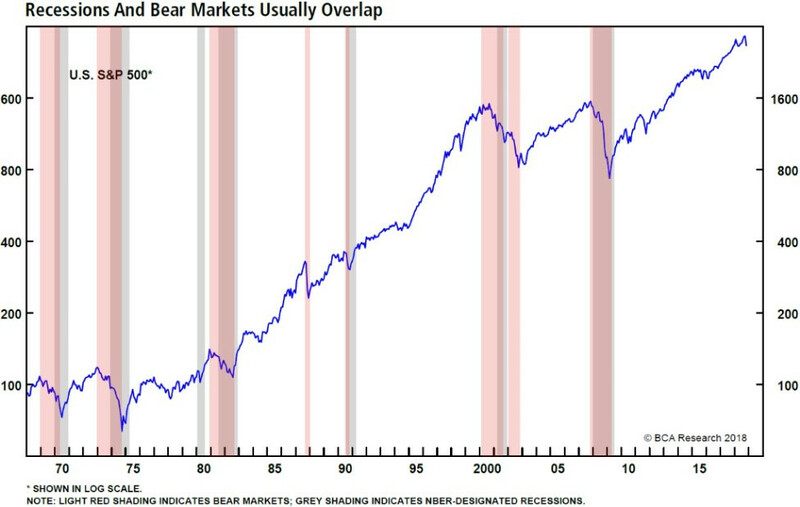 As the chart shows, bear markets (a 20% or greater decline from the most recent peak) typically coincide with recessions. While a recession does not appear to be an immediate risk, we are beginning to see the U.S. economy demonstrate traditional late cycle characteristics. For instance, the economy is operating above potential for the first time this cycle, an indicator that inflationary pressures may be building. Although monetary policy remains accommodative, the Federal Reserve has been removing stimulus by raising interest rates and reducing the size of its balance sheet. While the Fed has been taking a measured approach, a critical question is whether it will need to tighten more aggressively in order to moderate inflation. A positive aspect of corrections is that they help purge markets of excess. We frequently have cited the persistent outperformance of growth stocks relative to value stocks. We are cautiously optimistic that a shift in leadership is beginning to unfold as growth has lagged value by more than 300 basis points in October. Technology stocks have been some of the hardest hit. For example, after posting quarterly revenue growth of +30% but still missing consensus estimates, Amazon fell -7.8% on Friday and is down -18.0% for the month. The FANG stocks (Facebook, Amazon, Netflix, and Google) have lost approximately $350 billion of market value in October. While the relative strength of technology stocks this cycle has been rooted in solid fundamentals, valuations and earnings expectations imply that growth trends will need to be sustained. We became increasingly skeptical of growth expectations and elected last month to decrease exposure to the sector in client portfolios. 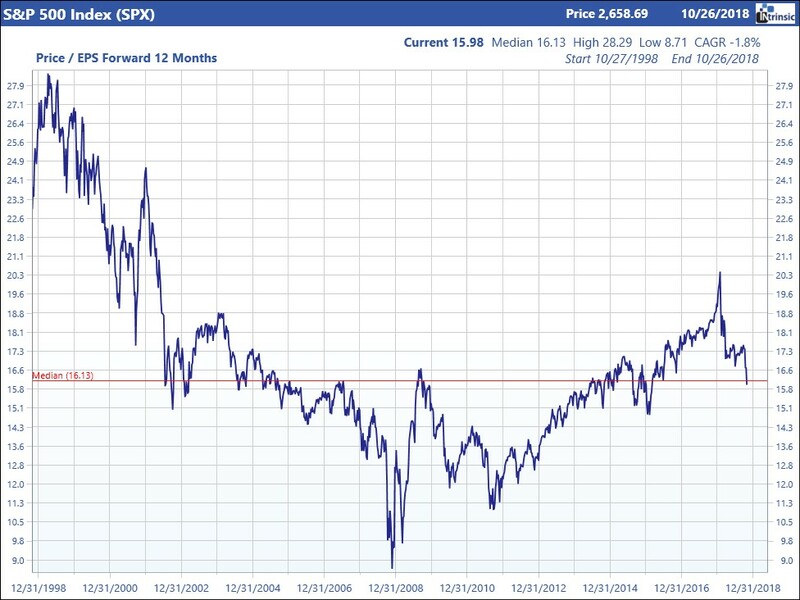 Additionally, U.S. stock valuations have become more compelling. As the chart shows, the S&P 500 index was trading at 17.4x forward earnings heading into October but has retreated to 16.0x, in line with historical average. Overall, U.S. stock valuations seem fair but not especially cheap. Seven of the 11 sectors in the S&P 500 are off at least -10% from their 52-week high. Roughly three quarters of the stocks have breached correction territory. While we believe in the long-term benefits of global diversification, we continue to favor the U.S. over international markets given stronger underlying economic growth. Within international equities, we maintain a preference for developed markets over emerging markets. Tariffs, a slowing Chinese economy, and appreciating U.S. Dollar are headwinds to growth, particularly in emerging markets. 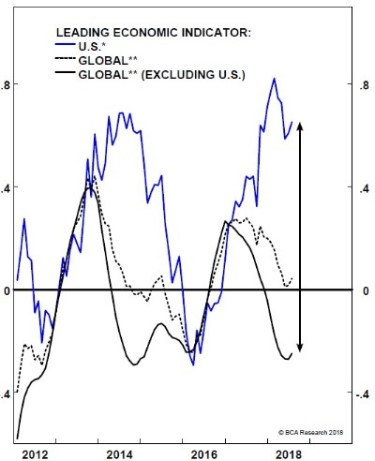 As the chart shows, forecasts for U.S. growth remain healthy while expectations for international markets have deteriorated. Our decision earlier this year to decrease exposure to international markets, including exiting emerging market equities, has helped mitigate risk in client portfolios. While valuations in emerging markets have become more attractive, they still do not appear to be compensating investors for risk. We continue to manage portfolios in line with strategic allocations, taking into account clients’ ability to accept volatility and their specific liquidity needs. We are proceeding with caution, focusing on potential areas of risk within global financial markets and economies. If you have questions about this information or your investment portfolio, please contact a member of the Investment Research Team or your Advisor. The information contained herein has been obtained from sources believed to be reliable, and its accuracy and completeness is not guaranteed. No representation or warranty, express or implied, is made as to the fairness, accuracy, completeness or correctness of the information and opinions contained herein. The views and other information provided are subject to change without notice. This site is issued without regard to the specific investment objectives, financial situation or particular needs of any specific recipient and is not to be construed as a solicitation or an offer to buy or sell any securities or related financial instruments. Past performance is not necessarily a guide to future results.